George Graham Reviews Acoustic Syndicate's "Crazy Little Life"
Despite pop music's current fads of manufactured teenage fluff, misogynistic rap, pseudo Latin performers, and in-your-face grunge bands, one favorable trend that seems to be emerging is that of jam bands. Still selling nowhere near the number of records as the fad bands, nevertheless, groups led by Phish have revived the tradition that rock borrowed from jazz, extended instrumental improvisations. And with renewed interest in acoustic music, it is natural that there be acoustic jam bands. Banjo man Béla Fleck has opened new doors for his seemingly humble instrument, and his Flecktones band has popularized the fusion of bluegrass and more electric realms. Actually there was a great acoustic jam band around since the late 1970s, New Grass Revival, of which Béla Fleck was a member before he started the Flecktones. More recent groups like The String Cheese Incident have added some bluegrass instruments to their electric jams. And back in August, we reviewed a new album by the group Hanuman, an all-instrumental ensemble that was the epitome of an acoustic jam band. This week, we have another first rate recording by a group that combines bluegrass instrumentation and influence with a more driving beat, writes really interesting musical compositions and adds the extra benefit of literate lyrics befitting a good singer-songwriter. 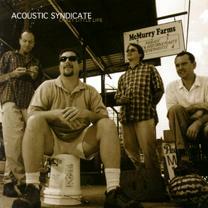 The group is Acoustic Syndicate, and their new third CD is called Crazy Little Life. Acoustic Syndicate has an interesting background. The members, who are somewhat older than one might expect, includes three members of a family from rural northern North Carolina, where they grew up on a large family farm and played music together, with an attraction to groups like the Police and King Crimson. But they also had daily interaction with migrant farm workers from Haiti and elsewhere, which brought them into contact with an eclectic range of styles. They include brothers Bryon and Fitz McMurry, and their cousin Steve McMurry. Bryon plays banjo, Steve plays guitar and is principal songwriter, and Fitz plays drums and percussion. They are joined by bassist Jay Sanders who plays both the acoustic and electric varieties of the instrument. The McMurrys played their mixture of rock and reggae on acoustic instruments as they grew up, and also developed the kind of tight vocal harmonies that being family makes possible. Their group has been performing regularly for about eight years, whenever the members' full-time work schedules permitted. Over the years they released two, reportedly low-budget, independent CDs. For their new album they got together with Nashville producer Bill VornDick, who has worked with some of the most significant names in New Acoustic Music, including Fleck, and New Grass Revival. Fitz McMurry, who had previously concentrated on hand percussion, switched to a full drum set to give their music a more driving beat. In Nashville, they also worked with New Grass Revival founder and multi-instrumentalist extraordinaire Sam Bush, who lent his fiddle and mandolin to several tracks on Crazy Little Life. The result is a fine album that combines first-rate musicianship and sophisticated compositions, including some in unconventional time signatures, a la New Grass Revival, and features some strong vocal harmonies with lyrics worth listening to. Acoustic Syndicate also combine a rather wide range of influences, including strong hints of Caribbean rhythms. While this is not really that much of a jam album, with most of the tracks under five minutes in length, Acoustic Syndicate does get to show off their instrumental prowess through their creative arrangements, and they do get a chance to stretch out on about three of the pieces. Otherwise their worthwhile songs and vocals make this an album appealing to more than just jam-band or New-Acoustic music fans. Acoustic Syndicate's new CD Crazy Little Life is a great musical blend from an outstanding North Carolina based, mostly family band. With their bluegrass, rock and tropical stylistic amalgam, first-rate writing -- both musically and lyrically -- and top-flight musicianship, the group makes an impressive outing on this first CD they have attempted to put before national audiences, after two limited distribution independent releases. In performance, they no doubt have more opportunities to get into extended instrumental jams, but this CD does provide hints of their instrumental strength, and with their high quality material, Acoustic Syndicate ranks in the league with the best of the acoustic-oriented jam bands. And this group also has some worthwhile things to say lyrically. It's a winning combination. In terms of sound quality, we'll give this CD a grade A. Engineer-producer Bill VornDick is one of the best in Nashville at understanding acoustic music, and it shows in the quality of sound. Jam bands and acoustic music are a happy combination when they come together, Acoustic Syndicate's new CD shows that they are a prime example.